This IFALOS™ Kithros aquarium, on display by Aquarium Adventure at the 2016 Aquatic Experience – Chicago, stopped people in their tracks. Those who attended the 2016 Aquatic Experience – Chicago at the beginning of November may have been lucky enough to see this aquarium on display by Aquarium Adventure. We shared the above photo of the aquarium on the AMAZONAS Facebook page and received great positive reaction. People who were unfamiliar with the aquarium assumed that this is simply a custom, one-of-a-kind display. But, as it turns out, this is a commercially available aquarium! We made sure to come back and get more details before the weekend was over. 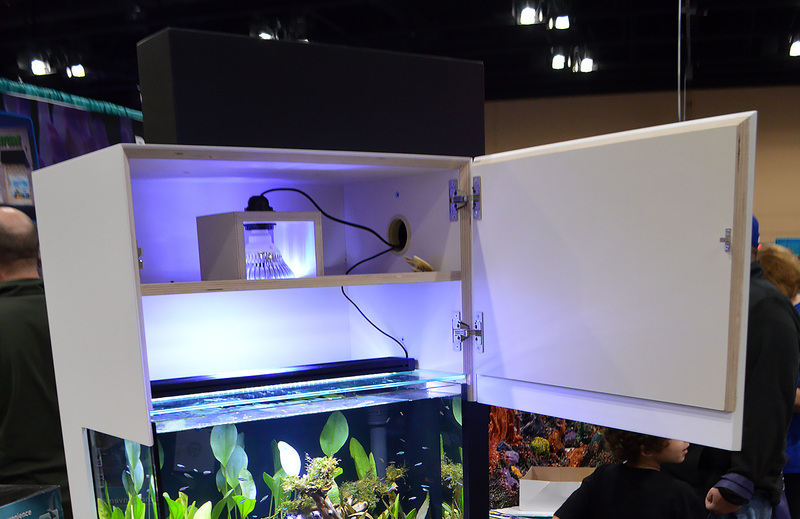 The IFALOS™ Kithros Aquarium Kit isn’t exactly a new product; it’s been on the market for at least a couple years in Europe, and it entered the U.S. market in 2015. 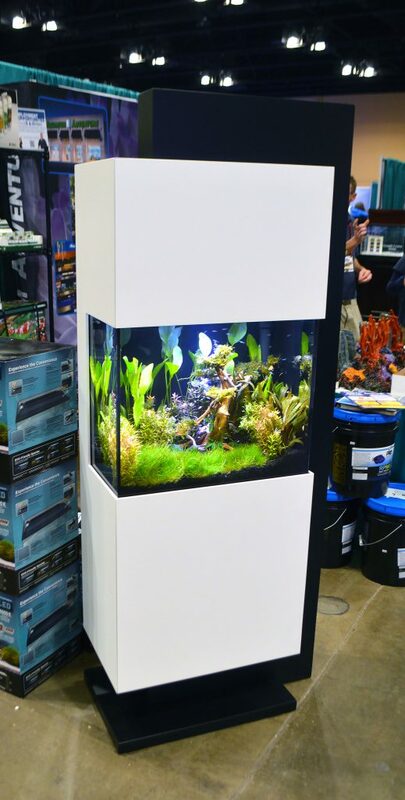 But it may feel new to you, because it’s not every day that you see a 23-gallon aquarium and stand that retails for around $3000 at your local aquarium shop or national pet store chain. These IFALOS™ aquariums are intended to bridge the gap between a standard aquarium and a truly custom offering. They feature contemporary design and high quality construction suitable for residential and commercial applications. The cabinetry is designed in a manner that hides the seams of the doors, making it appear, at first glance, to be a completely sealed facade. For the Kithros, the cabinetry is constructed of marine-grade plywood with Italian laminate exteriors. 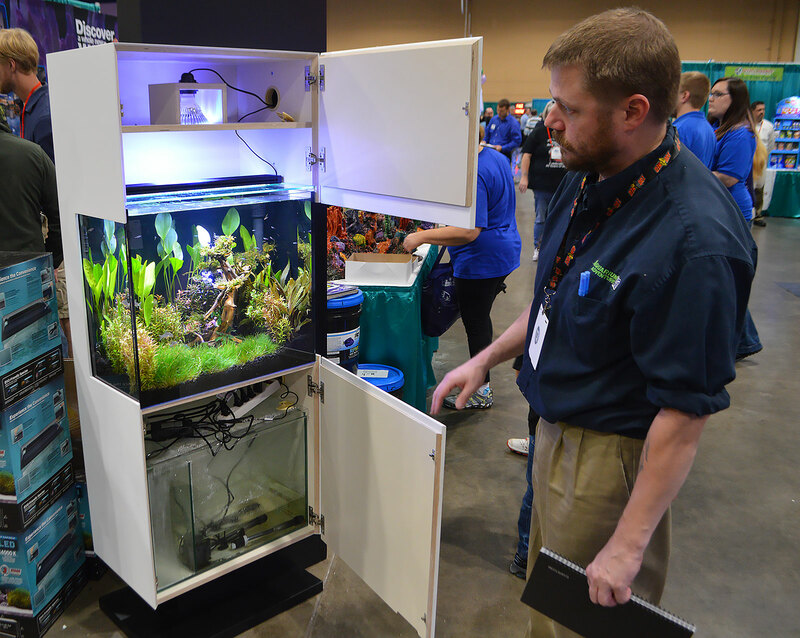 Aquarium Adventure’s Dave Drake opens up the Kithros cabinetry to reveal the inner workings of the setup. Dave Drake was kind enough to open up the display unit and show us the interior. He noted that the IFALOS™ line of aquariums isn’t something their shops normally stock, but it is something they make available on special order. The system is very flexible, equally at home as a marine aquarium or freshwater setup. It is available with or without a sump (the aquariums can be run with a canister filter as well). A look above the aquarium reveals ample space for LED lights and storage. Note the standpipe and return tubes in the aquarium, which allow for water to move between the aquarium and the sump below. The Kithros design’s standard color is white, although black, red, grey and beige exteriors are available as special-order finishes. Further details and interior looks at the Kithros kit–along with many other styles of the IFALOS aquarium line–are available on the Elive website. A beautiful aquascape inside this Kithros aquarium only reinforces the high-end aquarium that houses it. 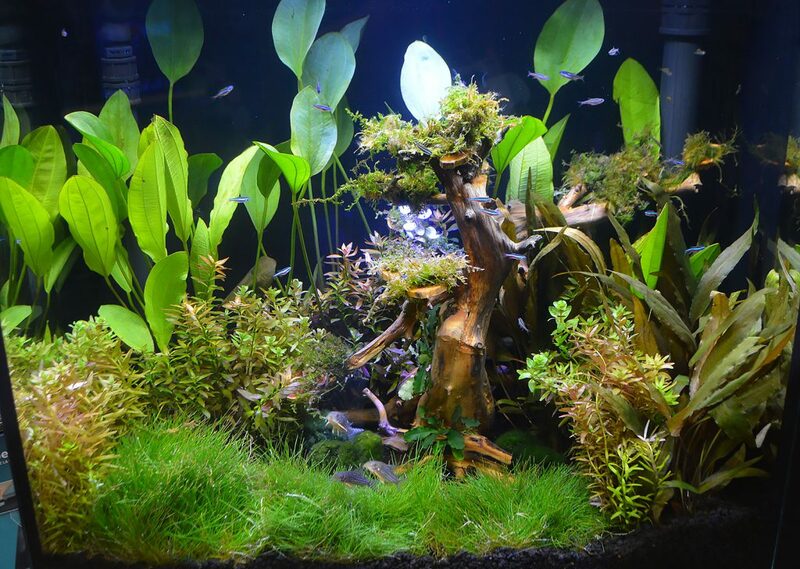 For more inside looks at these aquariums, including some set up as marine aquariums, check out John Carlin’s Fincasters video below.